As was the case with the Ghostbusters, Back to the Future, Jaws and even Robocop franchises, Home Alone didn't get a set of cards until the sequel. 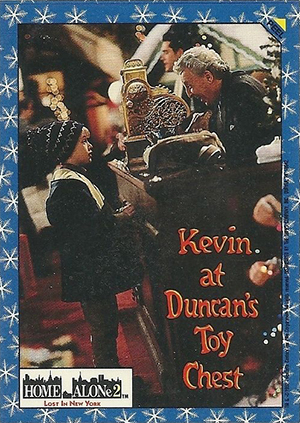 1992 Topps Home Alone 2: Lost in New York may cover an inferior film, but it is the best place in the hobby to find Kevin and the Wet Bandits. 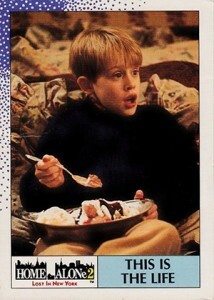 1992 Topps Home Alone 2 is one of the company's final no-frills entertainment sets. It consists of a simple 66-card base set and 11 stickers. Base cards follow a standard movie format of recapping the sequel that finds Kevin (Macaulay Culkin) on his lonesome on the streets of New York. As fate (or lazy writing) would have it, the crooks from the first movie, Harry (Joe Pesci) and Marv (Daniel Stern) just happen to be there at the same time. Card fronts are quite plain, although they have a definite feel for the period. The main image is surrounded by a white border save for the top that have a dark spotted pattern that reverses. It's a strange snow-like effect that is slightly reminiscent of 1990 Topps Baseball. Backs use a silhouette of the New York skyline as a backdrop for descriptive write-ups. Kevin is being chased by Harry and Marv. Stickers are inserted one per pack. Not numbered, they have blue borders that are decorated with snowflakes. Like a lot of Topps sticker sets, backs fit together to form a puzzle. 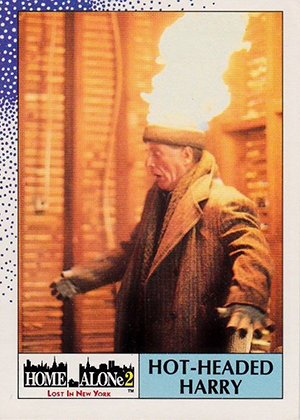 1992 Topps Home Alone 2 isn't rare, but it's also less readily available than a lot of other movie sets from the time. As a new generation is introduced to the franchise and the previous generation looks back on it with nostalgic eyes, it may see an uptick in interest. But part of the draw is also the reasonable rates for boxes and sets. It's a cheap trip back to one of the beloved modern holiday movies. Well, at least a sequel to beloved holiday movie. 8 Have a Nice Trip! 18 "My Family's on That Plane!" 19 Did We Forget Something? 20 What City Is This? 27 What Should We Rob? 28 World's Greatest Toy Store! 36 She Packs a Wallop! 39 We're in the Money! 49 "Come and Get Me!" 55 Attack of the Pigeons! 58 "Have You Seen Kevin?" 11 cards. Inserted one per pack. Stickers are not numbered.